A 55-year-old woman presented with a 3-month history of left shoulder pain occurring less than 24 hrs after receiving an influenza vaccination and a tetanus, diphtheria, and pertussis (Tdap) vaccination. She described her pain as dull/achy, 5 out of 10 (10-point scale with 10 being the worst pain) at rest, and exacerbating with shoulder manipulation, most notably with abduction. In addition, she reported persistent 3-4/10 dull pain at rest, sleep disturbances due to pain, and difficulty with lifting, carrying and driving. The patient denied prior shoulder pain, fever, redness, soft tissue swelling, interval trauma, excessive lifting, pulling or exercising. Physical exam findings were positive for left deltoid tenderness, restricted adduction, and tenderness upon passive abduction and arm elevation—reflexes, strength, and sensation were intact. Serum C-reactive protein was normal. After minimal avail from multiple sessions of physical therapy and oral pain medications, a non-enhanced MRI of the left shoulder was ordered. 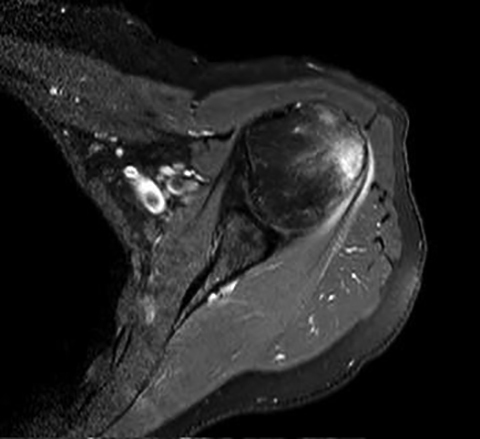 Initial non-enhanced MRI of the left shoulder demonstrated abnormal osseous edema in the lateral humeral head and neck, and abnormal soft tissue edema in the teres minor muscle, including its myotendinous junction and humeral insertion (Figures 1 and 2). These post-injection findings were attributed to sequela from direct needle impact and reactive change related to the injected material. 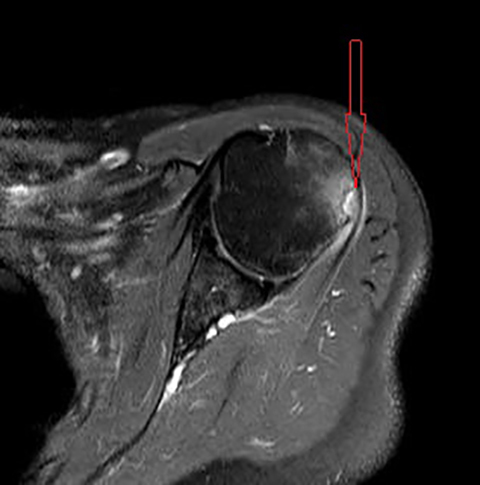 A 3-month follow-up (after an ineffective subacromial corticosteroid injection) non-enhanced MRI demonstrated ongoing inflammatory disease as evidenced by new visualization of an 8-mm humeral head cortical erosion (Figure 3). The patient’s pain persists, but at approximately 6 weeks post-injection, her pain with sleep reduced from 4/10 to 2/10. In addition, her rest pain reduced from 5/10 to 3/10 at approximately 7 weeks but with persistent mild restricted motion on physical exam. Shoulder injury related to vaccine administration (SIRVA). Less likely differential considerations include focal septic arthritis, calcific tendinitis with intraosseous penetration, gout, and seronegative spondyloarthropathic enthesopathy. The humeral greater tuberosity erosion depicted on our patient’s follow-up MRI reflects not only sequela of prolonged immune response, but it also strongly suggests direct needle impact—likely secondary to the CDC-recommended needle length given our patient’s weight. One of the 13 patients in the 2010 case series by Atanasoff et al underwent arthroscopic shoulder repair during which the surgeons explored the deltoid needle trajectory (as identified by the patient). The needle path revealed inflamed and scarred bursa and thickened tissue around a damaged tendon. In addition, the path led to abnormally friable bone on the humeral greater tuberosity, which was noted to give way with pressure from the surgeon’s needle. Our patient did not undergo surgical repair, but her MR findings are strikingly suggestive of similar pathogenesis. In addition to the persistent physical discomfort, diagnosing and managing SIRVA can be expensive. An uncomplicated flu shot is often free of charge; however, our patient’s initial “free” flu shot resulted in more than $18,000 of healthcare charges, not including the follow-up MRI and office appointments with her orthopedic surgeon. Fortunately, our patient has insurance and had to only pay about 20% of the cost out-of-pocket, unlike thousands of uninsured Americans receiving yearly vaccinations at local pharmacies and clinics nationwide. Prolonged shoulder pain occurring acutely after vaccination should prompt physicians to incorporate SIRVA in their differential of possible causes. In addition, vaccine administrators in healthcare facilities nationwide should be educated on the potential risks (physical and economic) of over-penetration associated with the current CDC’s needle length recommendations. Atanasoff S, Ryan T, Lightfoot R, Johann-Liang R. Shoulder injury related to vaccine administration (SIRVA). Vaccine. 2010; 28(51): 8049-8052. Barnes M, Ledford C, Hogan K. A “needling” problem: Shoulder injury related to vaccine administration. J Am Board Fam Med.2012: 25(6): 919-922. Lipper WC, Wall EJ. Optimal intramuscular needle-penetration depth. Pediatrics. 2008; 22(3): e556 – e563. Dumonde DC, Glynn LE. The production of arthritis in rabbits by an immunological reaction to fibrin. Brit J Exp Pathol. 1962;43: 373. Cooke TD, Jasin HE. The pathogenesis of chronic inflammation in experimental antigen-induced arthritis. I. The role of antigen on the local immune response. Arthritis Rheum. 1972;15(4): 327. Bodor M, Montalvo E. Vaccination-related shoulder dysfunction. Vaccine. 2007:25(4): 8049 – 8052. 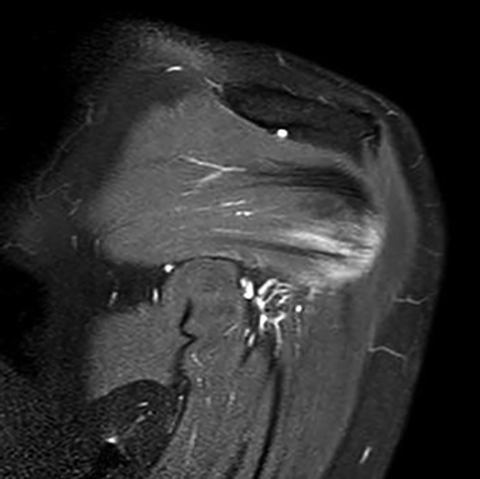 Radiological Case: Shoulder injury related to vaccine administration. Appl Radiol. Prepared by Dr. Taylor while a second-year resident in radiology, and Dr. Hinke while a fellowship-trained (digital imaging) radiologist, both at Aurora Saint Luke’s Medical Center in Milwaukee, WI.